Whew! Just returned from a 5.5 week road trip with my husband, visiting relatives, seeing sights, and mostly getting out of Tucson for the hottest month of the year. I took along a stack a promotional bookmarks to give out along the way–unfortunately, I first forgot about them (I am so bad at publicity) and then couldn’t remember where I’d packed them! Finally, about three weeks in, I dumped out my bag of crocheting and there they were. So I did manage to give out a few on the way home. It was a long time to be away from home, though, and we actually cut the trip short by a couple of days. Now we are settling back into a familiar routine, and I hope to begin editing on “The Aztec Eagle” this week in preparation for a fall (I hope) publication date. Happy Release Day: Beyond the Gates! 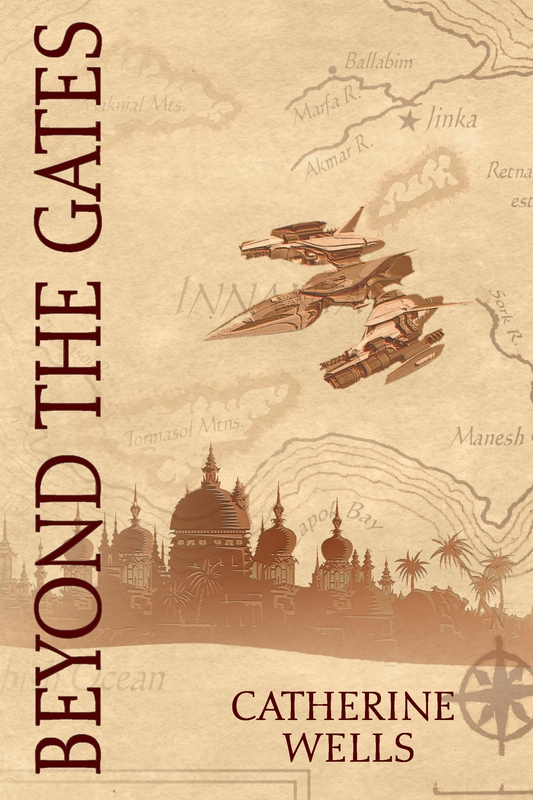 The reprint and ebook versions of Beyond the Gates are now available from Desert Moon Press! Happy release day, Catherine! Marta, a graduate student researching indigenous life on isolationist Dray’s Planet, discovers an animal that can’t be indigenous, but which can’t have come from anywhere else. The puzzle convinces the Children of the Second Revelation to bring two Unbelievers into their closed society. As the rival offworld scientists trek into the harsh desert to determine the creature’s origins, Marta stumbles onto another mystery: why do folk tales speak of roarings and screechings from the planet’s second continent, the uninhabitable Land Beyond the Gates? And why are the Faithful forbidden to set foot there? Coming on May 1, the reprint and ebook versions of “Beyond the Gates” from Desert Moon Press! Then watch for the sequel novella, “Builders of Leaf Houses,” to run in Analog later this year. For those of you who’ve been waiting (a decade and a half) for a sequel to “Beyond the Gates,” I just received an offer from Analog for my novella “Builders of the Leaf Houses.” (No pub date yet.) It contains the further adventures of Marta and Shipner and a look at Drayan culture through the eyes of Motherlove. I was so inspired by the offer, I’ve sent out two more short stories in the past two days! For you last-minute shoppers, the ebook edition of “Wastelands: Stories of the Apocalypse” is on sale for $1.99 until Dec. 30, 2014. Learn more about the anthology and where you can purchase it here. It features stories by Stephen King, George R.R. Martin, Octavia Butler, and of course, yours truly! Happy weekend! For the next two days, you can still order “Macbeatha” at the pre-publication price of $2.99. After that, list prices are in effect. And now it’s available for pre-order at Barnes and Noble and iTunes. Woo-hoo again!